These are pictures taken of the Notre Dame de Paris, a cathedral in France built during the Middle Ages. Two symbolic figures atop these flying buttresses are known as Ecclesia and Synagoga. These figures personify the Church and Jewish synagogue. 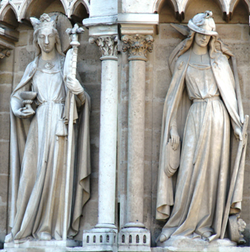 On the left is Ecclesia, who represent the Roman Catholic Church. She represents wealth by wearing a crown, carrying a staff and the Eucharist. The figure on the right, Synagoga, represents Judaism. Her head is bowed and her eyes are covered by a serpent. Serpents mentioned in the Bible are usually identified with the evil and are a temptation for sin. Synagoga’s crown lay on the ground, her staff is broken and she seems to regretfully hold the Ten Commandments. This could symbolize the the covenant has been broken and that Jews as a whole have sinned. This promotes a derogatory attitude toward Jewish people. Many could take these representations as a reason to punish Jewish people for their inability to hold their covenant with God. The figures also promote Christianity as a dominant religion. These images represent the religious conflict between Christianity and Judaism and leave an open interpretation for those to justify religious oppression. Another controversial Christian image appears in the Erfurt cathedral in Thuringia, Germany. This 15th century wood carving at the choir benches in the cathedral illustrates Ecclesia on a horse, armed with a shield, and charging toward Synagogue with a lance. Synagogue is riding a pig, which is a mockery of Judaism because pigs are considered unclean animals and cannot be consumed. Synagogue’s eyes are closed while gripping a branch for support as she awaits the impact of Ecclesia’s lance. It appears that Ecclesia is victorious and that Synagogue has been defeated. This image encourages Christian dominance over the Jews. The representation could be used to justify punishment of the Jews. Anti-semitism was not a new concept at the time of the Holocaust. This image shows that the anti-Jewish propaganda seems to have began in Germany well before the massive genocide took place. The violence presented in this wood carving could be interpreted literally and could potentially lead to Jewish oppression. The many anti-Jewish portrayals in European cathedrals are not known to be the cause of religious oppression such as the Holocaust, however, there is strong evidence that these representations are able to be interpreted in ways to promote Anti-Semitism. Saint Joseph’s University. “The Medieval Motif of Synagoga and Ecclesia.” https://www.sju.edu/int/academics/centers/ijcr/archives/Synagoga-Ecclesia.html. Voll, Fritz. “Anti-Judaism in Christian Art.” http://www.jcrelations.net/Anti-Judaism_in_Christian_Art__Some_examples_of_anti-Judaic_Christian_art__Eccle.2444.0.html?id=720&L=3&searchText=anti-judaism+in+christian+art&searchFilter=%2A.